If you don’t know what single stream recycling is, think about your bin at home. This “single” bin is where you put all of your recyclables (no sorting needed). Once that bin gets picked up from your house, it goes to Millennium Recycling where it is sorted by category, baled up and shipped to downstream processors who can process the materials and return them to the marketplace as new products. Any items not on this list may have alternative recycling options, but CAN’T go in your single stream bin. Use our Search tool to find other options or just ask us! Bag shredded paper in a clear plastic bag and tie shut before putting it in your recycling bin. 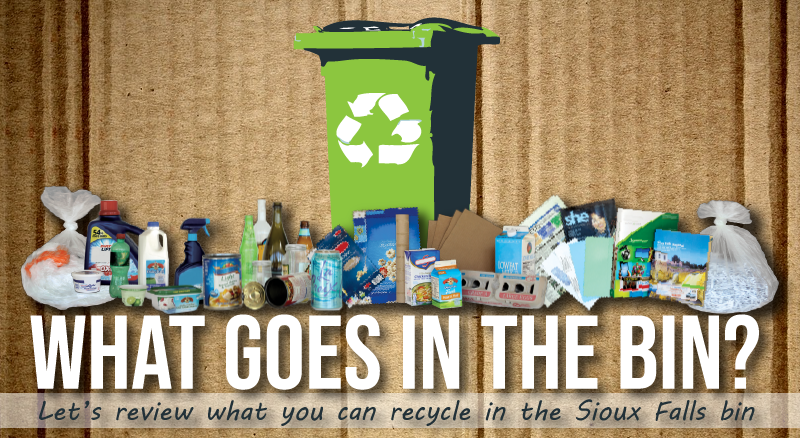 By increasing and improving recycling in Sioux Falls, we will extend the life of the Landfill and create a more sustainable community now and into the future. To make this happen, we need to work together to make sure we are recycling correctly for the process to be efficient and really work. Thank you for recycling right! Use our Search tool to find other options for materials not on the list or just ask us! There are 0 comment. on "What Goes In The Bin?"